The brand new TATULA line of bass rods are Finely Crafted with State of the Art Components. With Seven Categories of Rods and 21 different Bends the TATULA collection is a most complete professional collection of bass rods. The beautifully Crafted Natural Cork Handles provide timeless functionality combined with a sure grip. 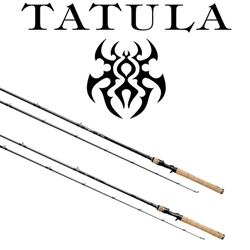 A slick Tatula Spider Graphic adorns the classic formed handles. The reduced weight blank resists ovalization allowing greater hoopstrength loads for a more precision load-up. The tangle free Fuji FazLite guides allow long accurate casts. If you are looking for a professional grade bass rod designed with a specific purpose in mind then take a look at the TATULA line of bass rods where we’ve built one just for the task.